A waffle baker, grill, and griddle, this three-in-one appliance comes in handy during breakfast, lunch, dinner, and after school. Key to the unit's versatility are two 8-inch-square cooking plates--one set into the product's bottom and the other into the hinged top. On one side the plates form grids for making four waffles at once. Flipped over to show their flat sides they're capable of top and bottom grilling a sandwich or steak. 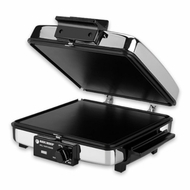 To create griddle space, the top opens up flat, forming two 8-inch-square cooking surfaces for all foods that love a griddle--such as pancakes, hash browns, and eggs. Channels send grease to spouts in the griddles' corners, where it drains away. Nonstick to release food easily and wipe clean, the cooking plates also can be removed for scrubbing. A heat control offers high, low, and medium temperatures. With its chrome housing and stay-cool black synthetic handles, this 900-watt appliance looks great on the counter. Afterward, the cord wraps around the hinge, plus you can stand the unit upright for compact storage. It measures 11-1/4 inches wide, 5 inches high, and 11-3/4 inches deep and carries a one-year warranty against defects.